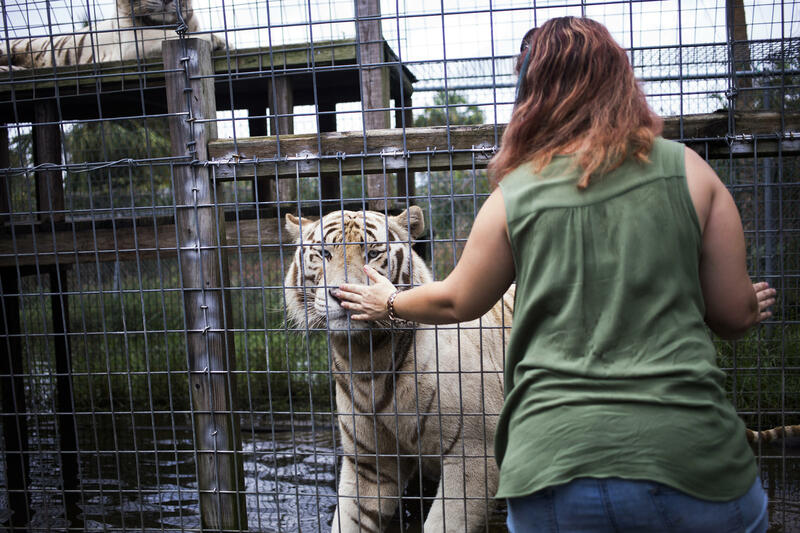 Volunteer Michelle Augustyn greets one of the twin white tigers at Kowiachobee Animal Preserve, which is located in the residential area of Golden Gate Estates in Naples, Fla.
Co-directors Grace and John Slaby live in a home on the Kowiachobee Animal Preserve in Naples, Fla.
Zahara the zebra takes a snack break, and a baby alligator and fellow Kowiachobee resident lays out in the sun. John Slaby prepares food for the big cats. He says the preserve is still working toward working to get back to normal. A wall in John and Grace Slaby's home reflects their passion. "If you're going to do this kind of thing ... you're not going to have a life outside of it," John says. Dexter the raccoon peers out of his cage. Benny and Joon, common marmosets, eat a snack. Volunteer Tim Greiser plays with Sabeena during a break. "We had anywhere from a foot to a foot-and-half of water across the entire property," says 50-year-old John. Irma's path was unpredictable before it made landfall. Forecasters originally expected Florida's Atlantic coast to take the brunt of the storm, but Naples, on the Gulf Coast, was hit directly as the hurricane moved north from the Florida Keys. "My wife is traumatized," John says. "The hurricane was still raging and Grace was already saying she didn't want to go through something like it again." "She [said], 'Let's sell the place and leave,' " he continues. "Definitely the worst storm we've been through and we've been through a lot of them." 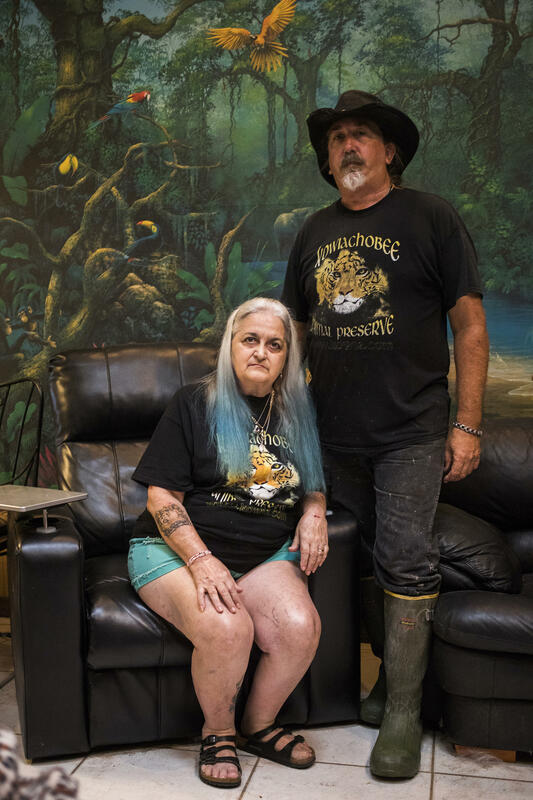 Grace, 63, worked for nine years at another facility in Naples before meeting John in 1998. In 2000, they started building their own preserve, which opened a year later. 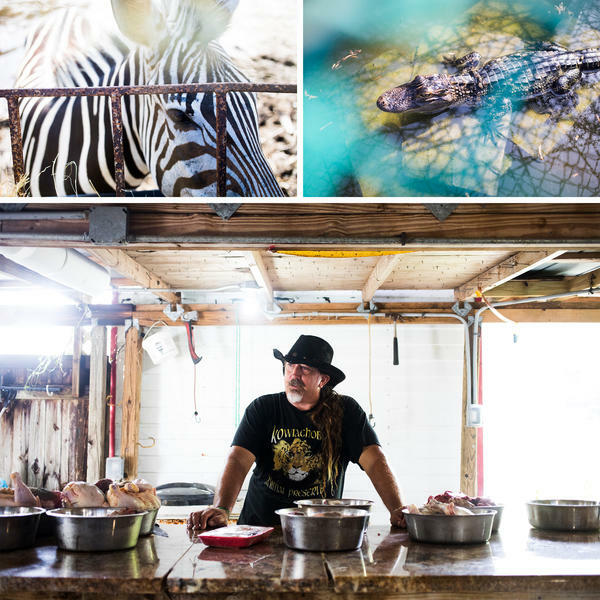 Grace and John live in a home at the preserve, and their days revolve around the animals. "If you're going to do this kind of thing ... you're not going to have a life outside of it," John says. "It really consumes everything you do." 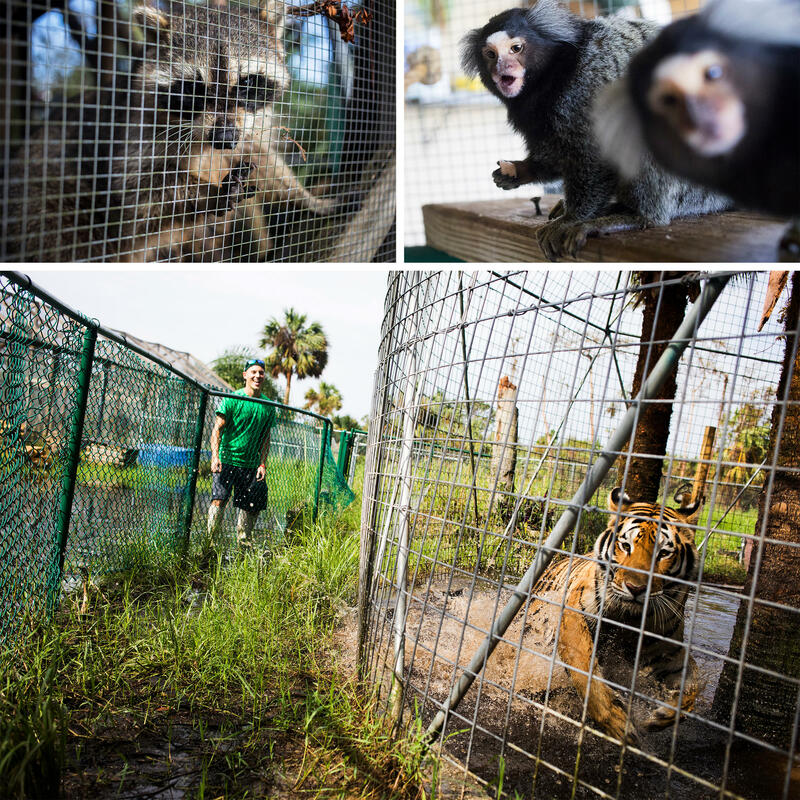 They have no paid employees, but about a dozen regular volunteers help them with everyday operations from animal care to office operations. Another 20 to 30 volunteers help with disaster recovery, off-site visits and other community events. Kowiachobee was built to educate elementary-school-age children in their community, and while it does rescue and rehabilitate animals, its mission is to provide awareness on issues related to animal care and conservation of exotic breeds. "There's a lot [of] different things that we teach," John says. "But with the elementary-age kids, we focus on trying to help the kids understand animals in general and the changes that occur in animals due to the evolutionary process, like you know habitat and climate and food source." They often focus on genetics, and John uses livestock, specifically horses, to illustrate this concept. "I teach kids about the history of the horse and the changes that the horses have gone through over thousands of years due to manipulative breeding and creating the different breeds of horses," he explains. 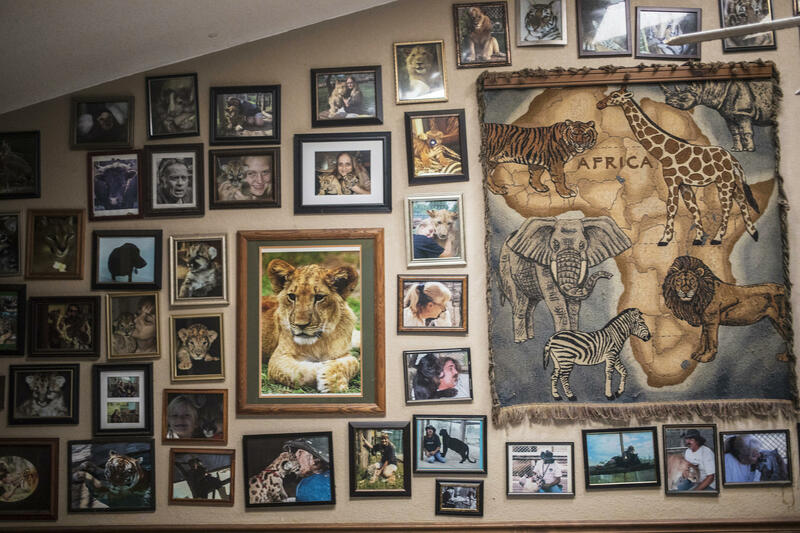 Now, he is working to re-create a safe space for those animals. The amount of help needed to make it through a storm grows quickly, John says. "We can get by with two or three people a day during the week [but] you literally need a small army to clean up the mess that's out there right now." In the week following the storm, the preserve had no electricity, limited phone service and a diminishing supply of gasoline. They used generators to run refrigerators that stored the animals' food and clean water since the floods brought in contaminated water. Kowiachobee has used its social media accounts to call for volunteers and donations as it tries to get back to normal. "You have a hard time bouncing back," John says. "It pushes to the verge where you're just like, 'I give up.' You don't want to give up. You really have to dig down deep and say, 'You know what, I'm not gonna let this beat me. We're gonna come back, and we're gonna come back stronger.' "
Cassi Alexandra is an independent photographer who splits her time between Orlando, Fla., and Brooklyn, N.Y.